Boyle Heights City Hall was packed Saturday for the first of several debates between candidates vying for the 14th district council seat in Los Angeles. Four of the five candidates – incumbent Councilman Jose Huizar, former L.A. County Supervisor Gloria Molina, social worker Nadine Diaz and community activist Mario Chavez – took part in the forum hosted by Boyle Heights Beat, a bilingual newspaper written by local high school students. Political consultant John O’Neill did not take part. Despite being more ethnically and economically diverse today due to redistricting, the eastside council district — which also encompasses much of downtown L.A. and northeast neighborhoods such as Highland Park and Eagle Rock — is one of the most coveted seats among Latino politicians who see it as the heart of the Chicano movement and Latino empowerment. It is also tends to be among the most competitive races in the city, this year being no exception. On Saturday, the focus was on Boyle Heights, one of the city’s most densely populated neighborhoods where 94% of residents are Latino – 54% of them foreign born. Approximately 75% of the area’s working-class residents rent rather than own their own homes and the median income is $20,000 less a year than the median income citywide. Boyle Heights is also a stronghold for political activism on issues ranging from pollution to education. As expected, the forum focused on hot button issues such as housing and gentrification, legalization of street venders, immigration, sidewalk repair, city services like trash pick up. Molina, who spent 24 years as a county supervisor before being forced out by term limits, taking a jab at Huizar, said she’s running because the district needs a council member who pays more attention to the eastside and is willing to work on basic issues such as fixing sidewalks and cleaning up trash and abandoned furniture. “You need to be a leader from day one”…not only when elections are approaching, she said. Huizar is seeking his third and final four-year term and countered Molina’s accusation saying his Clean Communities Initiative is improving conditions and that his office has secured millions of dollars in improvements to local park facilities, for fixing streets and sidewalks and to create more affordable, veteran and senior housing. He also touted the opening of the area’s first WorkSource Center to help residents improve job skills and find employment. He doesn’t think there’s been a time in Boyle Heights history that has seen so many improvements, he said. The debate repeatedly turned to housing issues. The neighborhoods close proximity to downtown L.A. has made it a prime target of developers, which some people fear could make Boyle Heights unaffordable for its low-income residents. One of the more controversial housing issues in recent history is the proposed Wyvernwood Garden Apartment complex mixed-use redevelopment project, which would demolish and replace 1,187 World War II era apartment units, located on 70 acres just off East Olympic Boulevard, with 4,400 rental units and condominiums in several new buildings as tall as 18 stories. Support in the community has been mixed, with some seeing the project as a move to force out low-income families and others contending the project will create needed housing and jobs. On Saturday, Huizar reiterated that he believes the project as currently proposed is too dense for the area and that the area’s aging infrastructure cannot support such a big development. Twice he pushed Molina to take a position on the issue. Chavez said greater community participation requires making meetings and hearings more accessible to residents. He said meetings of the city council’s affordable housing commission were held Wednesdays at 12 pm, making them inconvenient for working-class residents, thereby excluding them from having a say. “Gentrification is taking out the poor by the rich people,” Chavez said. When the topic turned to crime, Huizar said Boyle Heights’ crime rate the lowest it’s been in many years, giving credit to Los Angeles police and more programs to help keep young people out of trouble. More still needs to be done, retorted Molina. “We need to remove graffiti and tagging within 48 hours, we need a more aggressive position from the council,” she said. Chavez said a tagger is a “frustrated artist that doesn’t have the resources” and more youth programs are needed. “We need to increase the funding for our youth services,” he said. In regards to job creation, Molina said she supports efforts to revitalize business in areas zoned for commercial activity. She said allowing people to just set up “barbecue tables in front of their house” and start selling is the wrong approach. “We need to respect” residential zoning, she said. Huizar said the Los Angeles Business Center has helped new businesses like La 1st Street Taqueria and La Monarca Bakery get the resources and financial help they needed to open near Mariachi Plaza in Boyle Heights. CD-14 is encouraging the growth of local businesses, Huizar said. Following the forum, several attendees told EGP they were for the most part satisfied with what they heard and hope whoever is elected March 3 pays close attention to the issues in their neighborhood. “We want the next generation to have opportunities to succeed,” said Concepcion Hernandez, pointing out that after graduating from college his son returned to Boyle Heights to teach. Juaquin Castellanos felt the forum was informative but said he would have liked to hear more details about how the candidates would improve services in the eastside neighborhood. 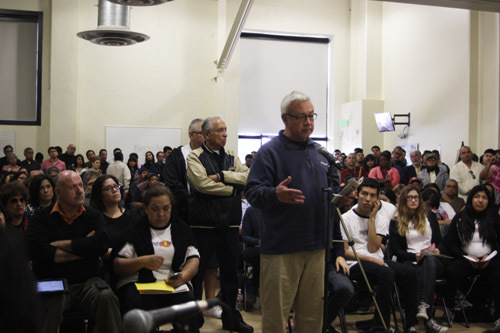 He said the candidates should start thinking about creating more resources for young, educated Boyle Heights natives who want to return to the community, but want better housing options such as new condominiums. The candidates were scheduled to face off again last night in downtown L.A. A third debate is scheduled to take place at 6 p.m. tonight in Highland Park at Luther Burbank Middle School and another at 6 p.m. Friday at the El Sereno Senior Center. 7-8:30pm—LA Unified District 5 Candidate Debate at Eagle Rock High School. Meet the Candidates before you vote! Confirmed participants: Bennett Kayser, Ref Rodriguez & Andrew Thomas. Eagle Rock High Auditorium: 1750 Yosemite Dr. LA 90041. 9am-3pm—Too Toxic to Trash: Free LA County Hazardous & E-Waste Roundup at Lugo Park in Cudahy. Safely discard household hazardous waste: antifreeze, unused medications, car batteries, used motor oil, paint, pesticides, hypodermic, pen & intravenous needles, syringes, lancets, household batteries, fluorescent light bulbs, and e-waste such as TVs, monitors, computers, VCRs, stereos, and cell phones. Park is located at 7810 Otis St., Cudahy.For more information, call County of LA Dept. of Public Works at 1(888) CLEAN LA or go to www.888CleanLA.com, contact LA County Sanitation Districts at 1 (800) 238-0172 or www.lacsd.org. 10am-12pm—CD-14 Candidates Debate at Boyle Heights City Hall. Boyle Heights residents will have the opportunity to hear about the candidates’ plans if they get elected in the upcoming election in March 3rd. Hosted by the Boyle Heights Beat. Candidates confirmed; Nadine Diaz, Gloria Molina, Mario Chavez, Jose Huizar. Location: 2130 E. First Street 90033. 10am-9pm—Monterey Park Lunar Year Festival Feb. 7-8. Celebrate the year of the goat during the annual street festival. More than 250 participating merchants, organizations & food vendors will take over East Garvey Avenue. Enjoy live performances, amusement rides & fireworks. Admission is free. Time: 10am-9pm Saturday and 10am-7pm Sunday. For info, visit, www.montereypark.ca.gov. 6pm—LAUSD District 5 Candidates Forum at the Old Timers Foundation in Huntington Park. Candidates Ben Kayser, Ref Rodriguez & Andrew Thomas. Location: 3355 E. Gage Ave., Huntington Park 90255. 6-9pm—LAUSD District 5 Candidates Forum at El Sereno Senior Center. Candidates confirmed Ben Kayser and Ref Rodriguez. Hosted by LA-32. Location: 4818 Klamath Place 90032. 6-7:30pm—Community Meeting on the City of Los Angeles Consolidated Plan at the Boyle Heights Technology Youth Center:1600 E. 4th St., LA 90033.